Spencer J.E., Wenrich, K.J. and Cole, T., 2015, Partial database for breccia pipes and collapse features on the Colorado Plateau, northwestern Arizona, v 1.0. Arizona Geological Survey Digital Information, DI-42, 5 p., 1 map plate, shapefiles, and Excel Workbook. Corrected the spelling of one authors name on the report and uploaded the corrected report on 6/29/2015. 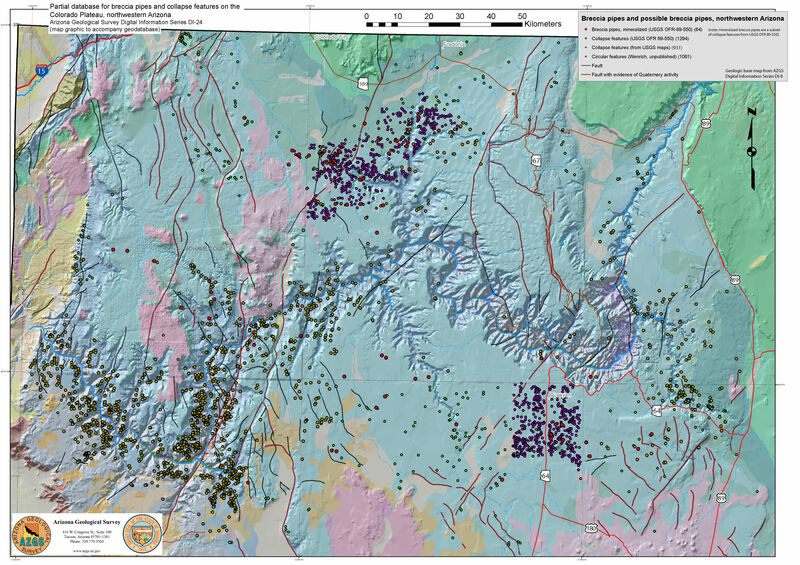 This publication, consisting of four structure and correlation sections across portions of the eastern Mogollon Slope region in east-central Arizona, serves as a companion piece to the Arizona Oil and Gas Conservation Commission subsurface structure maps G-6 (G-6a), G-7, and G-8. It represents an attempt to present graphically structural and stratigraphic information designed to facilitate future investigations of the petroleum potential by industry. PURPOSE AND SCOPE. The principal purpose in publishing the sections is to provide petroleum exploration geologists a graphic presentation of the subsurface stratigraphy and structure revealed by most of the wells penetrating basement rocks in the study area. Because of the widely diverse "picks" of the top of the Pennsylvanian Naco Formation, as reported in published literature and in well completion reports submitted to the Oil and Gas Conservation Commission, emphasis in presenting stratigraphic data on the sections has been placed on the interval from the base of the Fort Apache Member of the Permian Supai Formation to the top of pre-Pennsylvanian rocks. The petroleum potential of the marine carbonates in this interval, in addition to those of the Fort Apache Member of the Permian and pre-Pennsylvanian sections, has not been evaluated adequately in this frontier area. 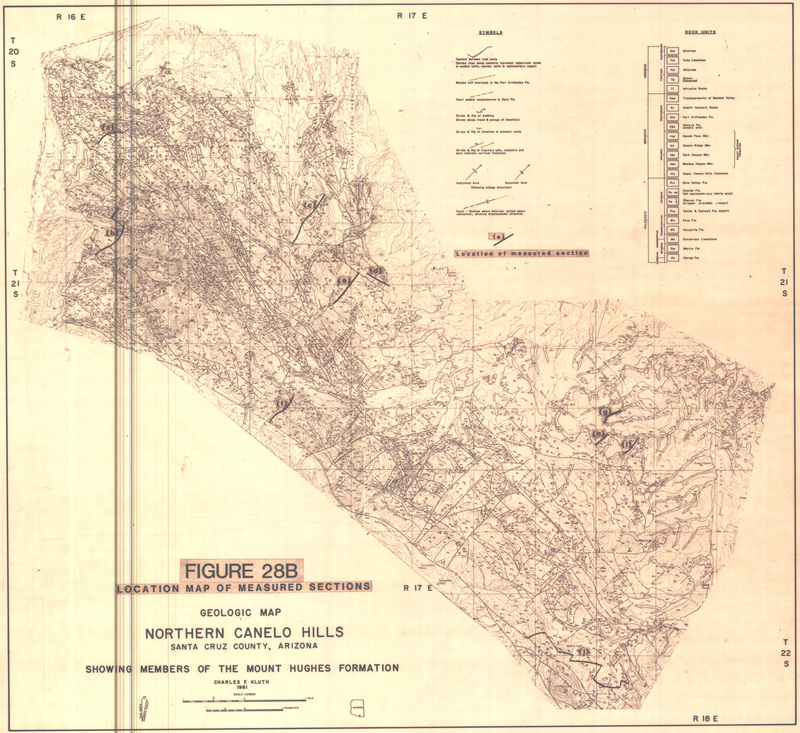 Conley, J.N., 1977, Structure and Correlation Sections - Eastern Mogollon Slope Region, Arizona. Arizona Geological Survey, Oil and Gas, OG-19, 4 plates. Originally published as GSX1 Structural and Correlation Section, Eastern Mogollon Slope Region, Arizona, in 1977.